Grinding Gear has detailed the next content patch for their free-to-play ARPG, Path of Exiles. It contains words like, "Torment" and "Bloodlines," which is how you know the game isn't being plunged into a month-long peace-treaty. Instead, PvP is getting an overhaul, and new challenge leagues are being introduced. In addition to Bloodlines, which synergises power between magic monsters, there is also a Torment Challenge. In it, your game will be haunted by loot-carrying spirits who can imbue nearby enemies with additional buffs. Also on the cards are some big changes to the PvP game. 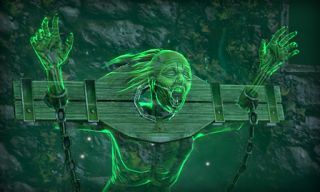 "A major focus of this Content Update is to overhaul Path of Exile's PvP systems and introduce formal competitive events," writes Grinding Gear. "As we've learned from our successful racing scene, having prizes and news coverage of competitive play is critical. In addition to introducing seasons of tournaments, we've performed a lot of PvP-specific rebalancing that doesn't affect the regular game." You can see a full run-down of the patch, which is due out on 12 December, over at the game's official site.